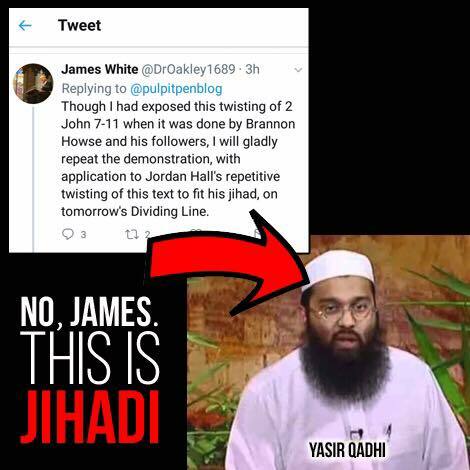 James White will be attacking us today for engaging in “Jihad,” which to him, means warning people about who just about everybody in the serious and meaningful theological world **except** James White recognizes is a dangerous false prophet. Recently, Dr James White had New Apostolic Reformation (NAR) Apologist Michael Brown on his Dividing Line show. As the show was underway, White continually referred to a continual ‘twitter storm’, that was brewing offset regarding the fact that White was “elephant-rooming” Brown. I’ll be joining @DrOakley1689 at 4:30 PM, EDT, for a special edition of his Dividing Line broadcast. We’ll separate truth from fiction! Throughout the interview, Dr White was indefensible in dealing with the criticisms of Michael Brown. Not only did he fail to thoroughly research his guest’s background, he failed to bother researching the topic on the New Apostolic Reformation. What resulted was nothing more than two adults acting like children ‘blowing raspberries’ at their more discerning critics. To end, we though it was worth noting Rich Pierce’s ‘smear piece’ against JD Hall. The hypocrisy of James White and those who defend him regarding the recent program which treated Michael Brown like a brother, gives reason for any discerning Christian to consider distancing themselves from such men. Frankly – Calvin, Luther and Walter Martin would be turning in their graves the way that James White and Rich Pierce have acted in light of endorsing Michael Brown and treating JD Hall as if he were not a brother in Christ. The accusation below is laughable considering ‘yellow journalism’ is what Michel Brown engages in when writing in defense for NARpostles with the gag-rags he writes for (Charisma News/Christianity Today). If JD Hall is accused of ‘Yellow Journalism,” then the standard of Brown is even worse. And evidently, James White would rather have a liar and false apostle (but good friend) on his show to talk about the New Apostolic Reformation rather than invite the authors of that “fairly in-depth” book on his show to talk about the real threats of the NAR. No, Michael Brown isn’t “the leading apostle of the New Apostolic reformation!” The current leading apostle of the New Apostolic Reformation is Che Ahn. Christian News and discernment sites have made it clear that NAR Apostle Michael Brown isn’t the NAR’s chief or leading NAR Apologist. No Christian site that we know of has called Brown the leading apostle of the NAR – modicum of research would have made that clear. And had further serious research been done, Michael’s Brown deception on the program would have been made very obvious. Strawman arguments – and many more. Clearly, James White and Rich Pierce are in serious damage control – damning and maligning anyone who had a problem with their ‘white-washing’ of an heretic. This was a shameful display of Christian character and discernment. The “Apologetics of Smear” were none other than Michael Brown and James White. Watch the Dividing Line segment yourself, especially towards the end. The reporting of Dr. Brown and his defense and endorsements of little gods (Todd White), false prophets (Benny Hinn, Heidi Baker, Cindy Jacobs, etc), heretics (Bill Johnson, Kris Vallotton, Carl Lentz, etc. ), and even felons such as David Yonggi Cho (who is still under investigation by South Korean authorities) and lawbreakers like Brian Houston are well documented. Brown has not renounced these dangerous men and women he defends and calls brothers and sisters in Christ. Yet White and Pierce are so lacking in discernment enough to believe a wolf and a liar at face value despite all the evidence and teachings out there on the internet by Michael Brown. The issue is not about Dr. Brown’s critics, the issue is the failure of discernment of James White and Rich Pierce. Their arrogance has got the better of them. Their false accusations against P&P are hypocritical and two-faced to say the least. The ecumenicalism that is festering at A&O Ministries needs to be noted and avoided. Truth was not their goal – embracing Michael Brown on this occasion was. Their hypocrisy, lack of discernment and ‘yellow journalism’ is disgraceful. They are in damage control and all they can do is attack those armed with hard-hitting evidence. May James White and Richard Pierce repent of their misleading Christ’s flock and act rightly in accordance with the scriptures. During a phone call back in April, as well as well as a subsequent exchange here on Facebook, I accused JD Hall of failing to “dot his I’s and cross his T’s” when he and his other authors write their articles. I believe that the failure to verify “facts” and to provide direct evidence for a writer’s assertions amounts to yellow journalism and I told him so. Further, I believe that he and his other authors engage in this practice regularly. The events of yesterday have once again exposed this all too common practice within christian journalistic circles and we need to make note of it. This method is now front and center in just about every corner of political journalism as rumors are commonly and unashamedly reported as fact in the news media every single day. This is a plague on our society that has turned “truth telling” into “smear job” by men and women that have a duty to do better. Yesterday, Dr. Michael Brown came on The Dividing Line and bluntly and repeatedly declared that the accusations against him were lies. If JD and his other authors actually followed my advice Dr. Brown’s denials might ring hollow. Instead JD has stood by these methods and continues to do so. The critical thinker is now left with the dilemma of having to sort out these claims that have been put forward about Dr. Brown in a sloppy and reckless manner. In contrast, Dr. Brown made it clear that he repudiates the charges and did so without hesitation. Such should cause all who are in Christ to think long and hard about the biblical witness that is required in order to accuse another. For almost 35 years Alpha and Omega Ministries has done fact based, christian apologetics by using careful research and reporting that those belief systems under review actually teach and believe. This requires us to put forward evidence along with sources. In the 80’s and 90’s we were critical of smears done in popular expose films on Mormonism as well as popular books published that smeared Roman Catholicism. We didn’t do this because we were sympathetic to those systems. We did it because we cared about the truth and wanted those who were trapped in those systems to take our apologetic seriously. We did it because we took the credibility of our witness seriously. It is my firm belief that this is the minimum standard for christian apologetics as well as reporting. Do we always meet that standard? Probably not as I am sure that someone somewhere can dig up more than one missed opportunity along the long path of 35 years of doing this. But it is and always will be our standard. In my opinion anyone who cares not for these things has no business doing this work. We have never engaged in apologetics by associations. The LDS founder Joseph Smith Jr’s teachings and activities are relevant. The company that he kept is far less so, if at all. The reporting about Dr. Brown of late has been laced with this kind of “guilt by association” smear job reporting and he confronted and renounced it handily on yesterday’s Dividing Line. If Dr. Brown’s critics had rolled up their sleeves and done the hard work regarding what HE actually teaches and believes there would have been no time to be looking around for any “strange company” that one might not approve of. In my opinion P&P continues to use tactics that are beneath the standards that should be common among those who value truth telling and I see no indication that they will be changing their ways any time soon. To be fair, they are hardly alone in this practice. [Editor’s Note: Hey, JD here. In that conversation with Rich Pierce to which he refers above, he did not beg me to “cross my t’s and dot my i’s” in our reporting. Rich was telling me that there had to be a reason Hank Hanegraaff absconded to Eastern Orthodoxy besides that he believes in Eastern Orthodoxy. Rich claimed that maybe Hanegraaff had early onset senility or Alzheimers, or maybe a close family member was pressuring him. It was at this point it became clear to me that James and Rich are fairly ignorant on Eastern Orthodoxy, in spite of their knowledge of Roman Catholicism. Anyone who knows Eastern Orthodoxy knows its much harder to be chrismated into that church than to join the RCC. To join, one must seriously affirm Eastern Orthodox beliefs and, in fact, already be thoroughly catechized in them.